"Be organized. Using this gift card box, you no longer have to worry about losing gift cards or monetary donations to be received at your wedding reception. Just place the box somewhere visible and have your guests drop their gift cards, checks, and money. This handy wedding gift box is perfect for weddings receptions, and bridal showers. Creative individuals will also find the box useful for commemorative events, birthday parties, etc. It is an ideal gift box that allows guests drop in their voluntary donations without their being exposed to the public. Just like a piggy bank, everything placed in the box remains safe and sound during the ceremony. At the end of the day, the bride and groom can then disassemble the gift card box to reveal its contents. The gift card box has a white satin exterior and comes fully assembled. Add a personal touch by decorating the box to go with the theme of your event. The box is 16"" long, 8"" wide and 10"" tall with enough room to hold as many cards from the average wedding reception. Order more than one box if you are expecting a larger number of guests. You may also tag each box with its appropriate owner if the bride and groom would like to receive donations separately. 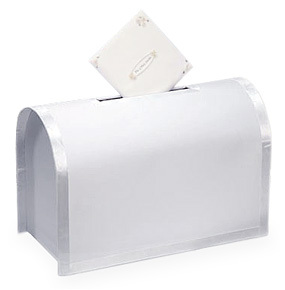 size: 16""W x 8""D x 10-1/8""H"
Leave Mailbox Wedding Card Box and explore thousands more photo ideas!